As time passes, your backyard can start to look a bit outdated, which is why you need to refresh it from time to time. 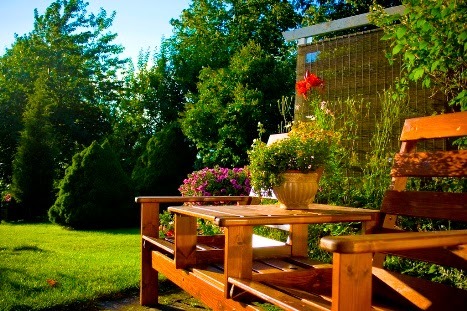 Here are a few simple tips that are likely to bring your outdoor setting back to life. A backyard remodeling project should be seen as a perfect opportunity to let your imagination fly. For example, it is a well-known fact flowers somehow make people happier. Knowing this, you can make use of this effect and enhance it by placing your plants in unusual vessels - old toolboxes, bright buckets, as well as any other interesting containers might all do the trick. Additionally, you can reinvent worn wooden objects. Take your old wooden chair, for instance, sand off the original color, treat it with a spray primer, then add a coat of spray-on paint, and add final touches with a spray gloss.If you have metal or iron pieces, you can get rid of dirt using a metal brush, after which you can use a spray-on primer on it, then paint and seal it. A skillful set lighting is bound to enhance the overall visual appeal of your backyard, especially at nighttime. There are different ways to accomplish this,all you need is a bit of imagination. Find your holiday lights, for instance, and wind them around your posts and railings or make use of the rope lighting (small bulbs in plastic tubing), which cost next to nothing at hardware stores. And if you feel like going more elaborate with lighting solutions, you can decide on, say, posts with LED lighting or several spotlights to add some drama to certain parts of your backyard and place emphasis on particular objects. Here are some creative ideas. Adding various accessories can certainly cozy up your outdoor setting. If you have some glassware, bowls or pottery you no longer use, you can fill them with sand, bits of sea glass and seashells. Alternatively, you can sift through the search classified advertisements websites in order to find literally tons of useful features, a good portion of which you can even get for free. And how about throwing some indoor pillows on an old swing bench or your wooden chairs? This slight adjustment can give your outdoor space a fresh look, but as they are commonly not weatherproof, don’t forget take them inside at night. When it comes to your lawn, you can add a gorgeous, rustic stone path on it. If you really want to finish your backyard revamp in style, you should consider adding some modern elements. If you are lucky enough to have a swimming pool, for instance, you can install frameless glass pool fencing, as this will provide a see-through effect that oozes sophistication and style. Other features that will lend contemporaneity to your yard include planter benches (a combination of ordinary benches and plant containers), comfy outdoor armchairs, futuristic garden sheds and fire pits.